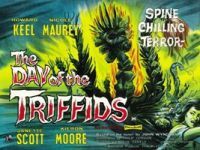 A version of the John Wyndham novel in which 99% of the world's population is blinded by a meteor shower and the survivors are terrorised by the people eating triffid plants. This is good for a 1960's sci-fi film and the effects are effective for films of this period. However the 1981 BBC series is still one of the best versions.